When working on a new thermoset, the cure process is essentially unknown. What happens when the material is heated? When is the best time to apply pressure? How fast does the material react at different temperatures? Dielectric cure monitoring, or dielectric analysis (DEA) takes its place among more conventional thermal analysis techniques of differential scanning calorimetry (DSC) and dynamic mechanical analysis (DMA) to bridge the gap between laboratory and manufacturing environments. DEA, DSC and DMA measure different material properties. DEA does not replace either DSC or DMA, but instead complements them. 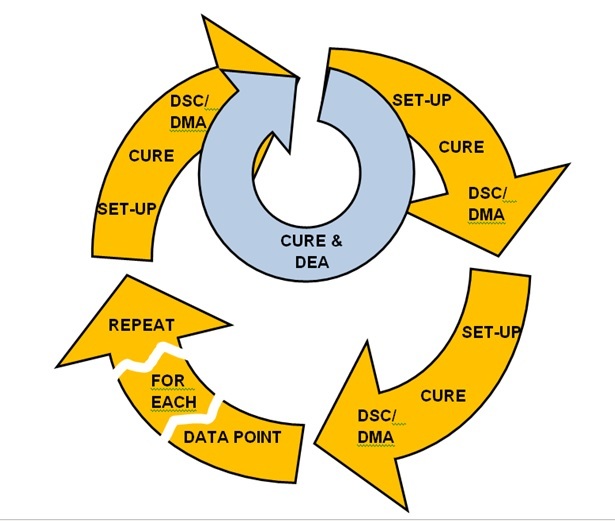 In R&D or process development, DEA has the advantage of very simple sample preparation and the ability to make measurements during the entire cure in real time. Dielectric cure monitoring can accelerate R&D by deferring the need to make laborious DSC or DMA tests until near end of development. DEA has the advantage of allowing material tests in a wide variety of conditions, both in the laboratory, the QA/QC bench or the manufacturing floor. No other method has this versatility. Dielectric cure monitoring may be performed in an oven, on a hot plate, in a press or mold, in an autoclave or in an actual composite part being developed or manufactured. When embedded in a part or a large mass of material, the dielectric sensor can directly measure the effect of an exotherm on the rate of cure. Dielectric cure monitoring correlates with measurements from more conventional laboratory tests, such as differential scanning calorimetry or dynamic mechanical analysis. As a result, DEA can act as the “go between” that brings information from the research lab to the manufacturing floor, and from the manufacturing floor to the manager responsible for product quality.